Recent security attacks on some of the world’s leading finance, industrial and commercial enterprises have created waves of discussion between security experts and enterprise leaders. The buzzword? Enterprise security. In 2017 alone, several reputable enterprises had to face a harsh reality – their systems were vulnerable to cyber crimes and they were ill-prepared. In fact, according to a report by Kaspersky Lab, the average cost of a data breach in North America costs $1.3 million for enterprises and $117,000 for small and medium-sized businesses. These statistics paint a disturbing picture: enterprises are not equipped with the necessary technologies to ensure highest-level security. It could safely be assumed that an enterprise’s technology adoption rate is much slower than a normal cyber criminal’s hacking schemes. Most of them either don’t have the tools and resources required to monitor security, analyze or understand security threats, or mitigate the threats. As enterprises move on to the Internet and the cloud, they are at increasing security risks and the slow adoption rate further increases the gap in defenses against threats that have crippled businesses and organizations. So this brings us to an important question – what exactly is enterprise security and why do we so badly need it today? 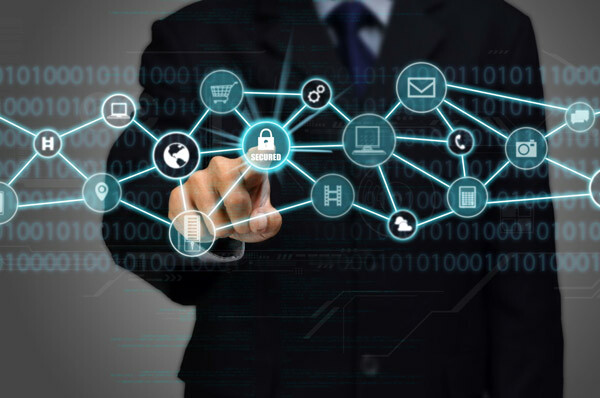 Simply put, enterprise security is a much-needed mechanism to deal with increasing problems of data theft, security breaches, authorization and authentication of an organization’s computing resources. But there is more to enterprise security than just a defense mechanism; it is a management framework that monitors, tracks, prevents and mitigates security attacks. It doesn’t suffice with setting up firewalls or anti-viruses or SSL certificates because it requires a holistic approach to creating safety guidelines, implementing policies and defining proactive measures against malicious threats. Enterprise security management does not start with protecting a specific system; rather, it starts by identifying business objectives that are closely tied with security implementations. It enables businesses to obtain clarity when it comes to understanding vulnerability vectors at both the infrastructure and data security level. Hackers are smarter than ever. They know attacking large systems is difficult and time-consuming, so they attack individuals instead. Most of the ransomware cases that gained the limelight in 2017 occurred because people opened suspicious emails, clicked on malicious malware or simply failed to update their security settings. Hackers can easily impersonate companies, make fake accounts and not get caught as people generally click on emails and links without giving it a second thought. It is getting increasingly difficult even for a tech expert to identify the true from the false as hackers become more refined in their phishing methods. Some will pose as a candidate emailing you their CV, while others will pose as PayPal offering you some benefits in return for signing up or for providing your account details. Unfortunately, many naïve users do fall for these spoofing tricks and end up compromising not only their systems but that of the entire organization as well. Enterprise security frameworks these days strongly emphasize strongly user training, ensuring that the organization’s people understand the security risks of opening unsolicited emails, link baits, and other phishing tricks. Last year, an email from the supposed Chairman of Standard Chartered made rounds, asking the individual to sign up for being a nominated inheritor to a dead client’s account in return for sharing half of the profit. Similarly, an employee from Fifth Third Bank wired $52 million to a fraudulent account. These stories may seem like they are from another world. After all, who’s silly enough to go through all this? Sadly though, these threats are real, their personification seems legit to the naïve user and they are often very effective at prompting impulsive responses. Once more, employee training is needed. All transactions must be verified and red flags must be identified and noted. That being said, this also indicates the need for companies to have a public complaint board where people can inform them of these security breaches. In the case of the Standard Chartered email, there was no portal where an affected user could have highlighted the scam. In the case of Fifth Third Bank, why wasn’t there a process to verify transactions before sending out such a large amount? These are important areas enterprises need to look into in the near future. The Internet of Things (IoT) is the future: everything connected to one central platform. Take an example of Apple products – the iPhone, the Mac, the iPad – all centrally synced with the iCloud. Anyone hacking into the iCloud can hack into the devices, and this is already happening with many people. Imagine, the same problem happening at a larger scale – connected public utilities, water systems, electrical systems, water towers all can be compromised if there is a single loophole is vulnerable. From insecure cameras to USB viruses to tricky surveillance malware, there are plenty of ways a hacker can enter a system, compromise it and leave a wide network of interdependent units completely useless. It’s no longer about website hacking, data theft or password leaks – it’s about an ecosystem, a sustainability that gets increasingly vulnerable as it attempts to become efficient. Enterprise security management, therefore, is not just a protective framework – it’s one that identifies the future, creates the necessary preventive measures and attempts to secure rather than to fight a breach. Ransomware has gained a whole new precedence with the rise of cryptocurrency. Leaving no money trails or worries of broadcast an identity, criminals feel more empowered to corrupt systems with ransomware. The WannyCry attack, for example, demanded $300 bitcoins, the equivalent of $75,000,000 at current rates. In the wake of this attack, organizations learned the value of backing up information. Those who did not have automatic backup solutions faced a tough time with data loss and its cost. For enterprise security experts, this was the time to reiterate the age-old instruction – back up your data. That way, even if your system is wiped off, you can still access your data and avoid paying the ransom. These security threats are seemingly harmless, which is probably why they are not taken seriously by organizations until a full-scale hit results in the loss of millions, but It is high time organizations large and small move beyond firewalls, passwords and authentication systems and adopt a more progressive method. It is therefore of utmost importance in today’s evolving age that you take the adequate measures to upgrade your organization’s security systems, provide extensive trainings to your employees for identifying red flags in an electronic communication and consult with experts to evaluate, assess, upgrade, monitor and maintain your organization’s digital security. It’s much better to invest the time now than to risk the chance of your business collapsing around you simply because you did not have an adequate backup option, monitoring framework and security training initiative for your employees.